Blame it on cabin fever, blame it on the beauty of the snow or blame it on Valentines Day that is just around the corner but I felt the need to play dress up this week. My cousin and I used to play dress up with my grandmother's clothes when we were little. Hats, long dresses, heels, the works. So since we were snowbound most of this week I decided to make the best of it. This is not my norm because this outfit is not weather appropriate and is completely impractical. But it fit so well with the scenery! We are covered in snow here in North Carolina but instead of talking about the weather I am going to talk about beautiful jewelry...and diamonds. Now, I am not a big jewelry wearer or collector. I went through a phase at one time where I was slowly working up to a nice collection of beautiful jewelry like a small sapphire or some rose gold here and there. Lately I have been wanting to get back to collecting special pieces that can stand the test of time. When I was contacted by Brilliant Earth to take some of their jewelry and style it up I was excited. I can window shop diamonds and gold! Sure! Ethically sourced diamonds and engagement rings are Brilliant Earth's forte. They specializes in going above and beyond the current industry standards to guarantee that their diamonds originate from pure, ethical sources. For this Personality Style Challenge we were given six different personalities to chose from. 1) jeans & tee shirt kind of gal, 2) floral, feminine styles & patterns, 3) glamorous like stilettos and glitter, 4) minimalist, no-nonsense elegant style, 5) vintage dresses & thrift store shopping, and 6) cutting edge. I toyed with the idea of going with a personality outside of my comfort zone. 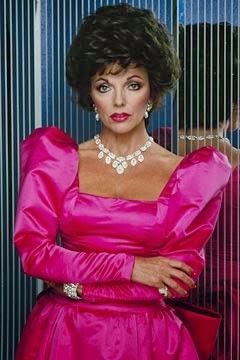 Like this fabulous Dallas lady Joan Collins. Just look at that vengeful stare! Her diamonds are intimidating ya'll. But that's how Joan got things done. And shoulder pads of course. She probably hid diamonds in her shoulder pads for extra power. I also liked the idea of the vintage girl because that is close to my heart as well. In the end I went for the minimalist, no-nonsense, elegance style because that is who I feel like I am right at this moment. This may change people! So don't hold me to it if I show up in a hot pink prom dress for Christmas. Doesn't this style board just scream casual elegance while strolling through the market picking up brie and champagne for dinner? Yes. It does. Now I want brie. Just a little bit more about Brilliant Earth....not only do they make it a priority to stop the trade in blood diamonds they also donate 5% of profits to help communities harmed by the jewelry industry build a brighter future. Disclosure- I was not compensated for this post in any way. I participated for a fun challenge. All opinions in this post are my own. I used polyvore for my styleboard. I was looking for a belt in my under-the-bed-mess-of-a-belt-box and rediscovered these suspenders. I picked them up at a thrift store or somewhere Lord knows where forever ago and never put them to good use. I thought, hey! 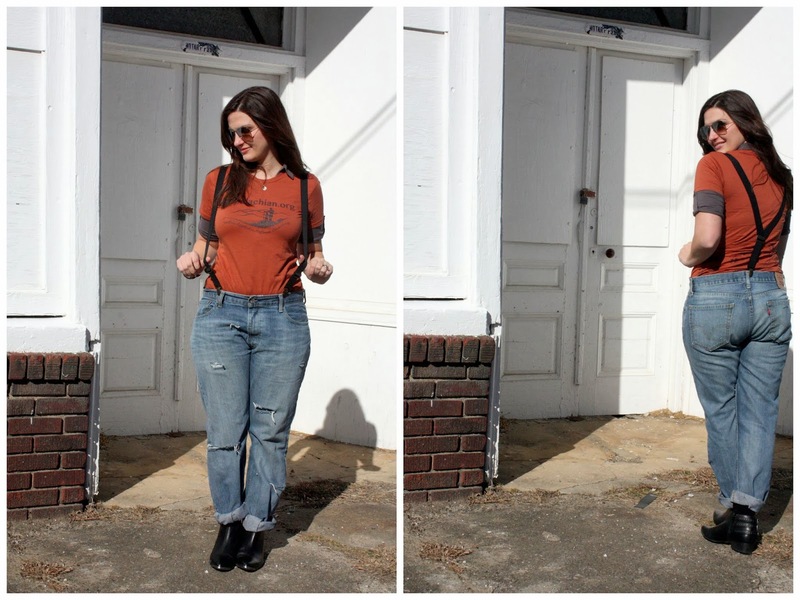 I really do need suspenders with those men's jeans if I don't wear a belt. It worked out well! I felt silly at one point and started to think I had no idea what I was doing then I thought, nope, I like it! Go for it! I incorporated my new chuck-chucks bracelet in with this outfit. It worked perfectly with the hipster vibe I was going for. I'm only missing a toboggan. And a beard. The mission of the Southern Appalachian Highlands Conservancy is to conserve the unique plant and animal habitat, clean water, farmland, and scenic beauty of the mountains of North Carolina and Tennessee for the benefit of present and future generations. Since 1974, we have protected over 60,000 acres from the Highlands of Roan to the Great Smoky Mountains National Park. 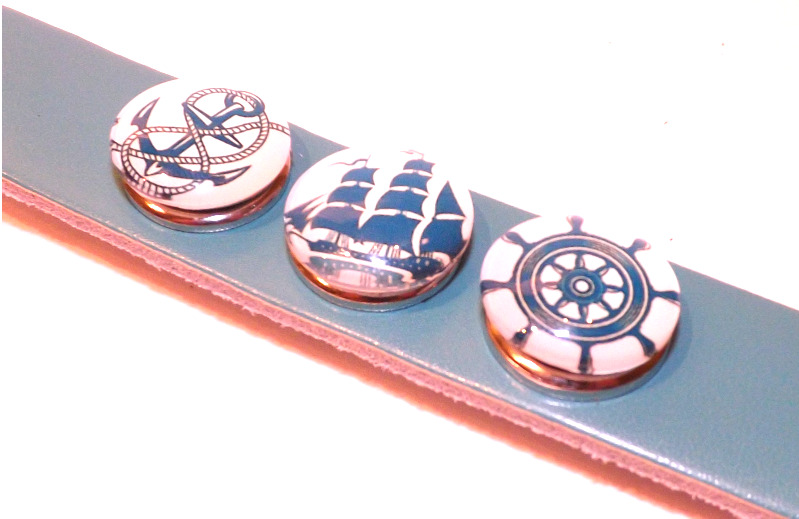 Looks at these cute nautical charms! Ok, ok, so lots of choices to sort through! I am a detailed kinda gal so it took me a little while to pick the ones that would be perfect for me. I really wanted to go more organic I guess if that's what you can call it. I chose 6 different charms. Aren't they great?! I was very impressed with the quality. 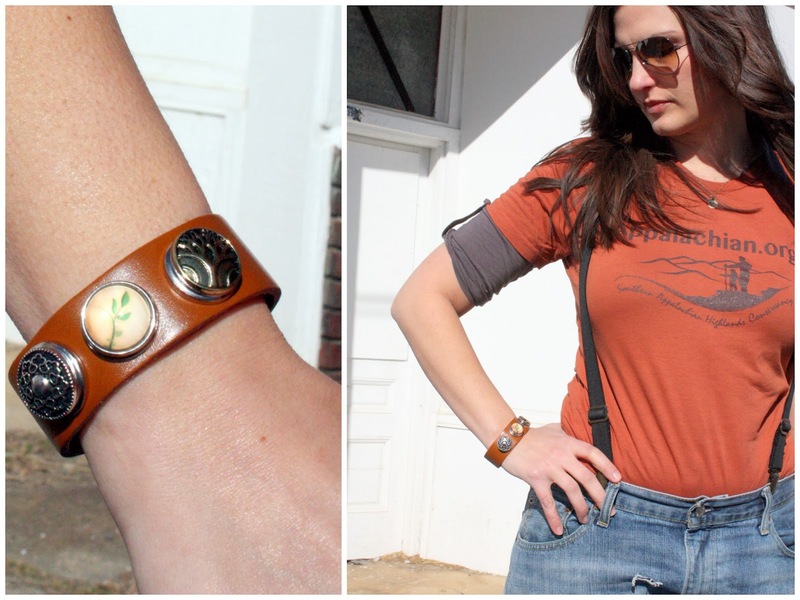 I chose the camel colored leather bracelet. The possibilities are endless. Ok...well I have 6 charms so basically I have 36 possibilities? No? Yes? I don't know! Let's just call it endless and be done. In case you are curious...this is how it comes packaged. You will get a black circular jewelry case and each charm is individually wrapped with tissue paper. The bracelet is wrapped around the charms inside the box. I like how the bracelet was kept circular in the packaging. Here's what it looks like on my wrist. I would say I have small to average sized wrists. The fit is great. You know how some bracelets want to move around and are too flimsy? This one does not. The snaps are sturdy and the bracelet hasn't come off randomly while I'm doing my thang. All in all, this is a great product. Lots of variety, very affordable and good quality. Meets my requirements!! Would you like one too? I have a great coupon code for you! You can go to www.chuck-chucks.com and use code jessicau1 for a 50% discount!!! 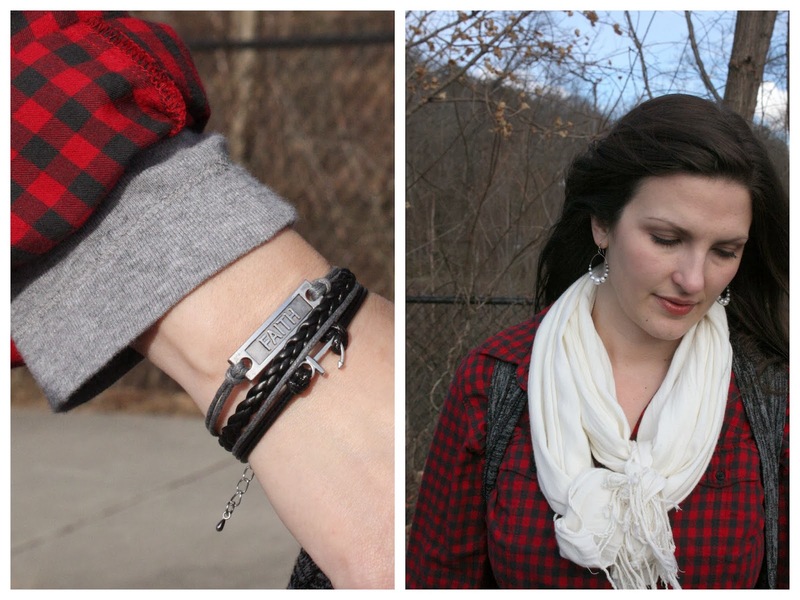 I worked my new bracelet into an outfit so I will be sharing some outfit photos including my chuck-chucks! Stay Tuned! I am wearing my other pair of new boots I bought with my Christmas money but I didn't get a good photo of them here. I will definitely be wearing them again so you'll get another look! As a matter of fact you will probably grow so sick of seeing them. They are crazy comfy. I wanted to show you this sweet little bracelet I got from a good friend. She is my leader of the twelve step group that I am working through right now. The bracelet has an anchor on it and she encouraged us to be anchored in our faith. YES! I love it and it went so very well with this outfit. Sweater: Target, Jeans: NY&Co, Boots: 6pm.com; Seychelles "It's About Time"
My new black ankle boots just came in the mail a couple of days ago and I couldn't wait to wear them. I have been wanting a pair of black ankle boots since at some point last year and wish listed a bunch of different styles. I finally settled on this pair from Seychelles. I found them on 6pm.com for a great price. They really fit the cool, laid back but edgy style I was going for. Since I have given up on heels, ok maybe not all together given up, but I despise to wear them most days, these ankle boots play the part of being comfortable but still stylish. The pointy toe is just a dream. I did have to stick an empty wine bottle down in both of them to open up the ankle opening a bit. (Keep empty wine bottles to stick into your boots when they are in the closet. Helps hold their shape. Pool noodles cut down to size work well too I have heard.) Anyway, they were a little flat from being in the box and they were rubbing on my legs and ankles. It worked perfectly and now they are more rounded at the top. Much more comfy on the ankles. Ahhh...it feels so good to feel good! I'm so happy that I am done with my antibiotics and I am done with my sore throat and I am feeling better. Yes. I'm sorry for the lack of posts but I'll get back into the swing of things I promise. With the silly polarvortex, school being out and losing power I just lost the desire to try to cram blogging into my day. Then I went on a "Girls" bender and watched season 1 and 2. I never knew I would like that show but I do. Who knew! Oh and here is another one of my new necklaces I picked up with my Christmas moolah. Cute, cheap and chunky. Love it. Good gracious! I thought I would never get over my sore throat that lasted 20 days! I was basically sick in bed most of the week before Christmas except for a few hours in the middle of the day that I felt good. By the evening my throat was so raw and I would cough and cough the whole night through. I had 3 strep tests and one mono test that all came back negative. On my 3rd visit to the doctor they finally gave me antibiotics. And guess what? I felt better in 24 hours from my first dose. I knew I had strep throat. I just knew it. But I never tested positive for it. My husband did though. The doc said sometimes you do have it, you just never test positive for it. Perfect. Needless to say I am feeling better and I am loving it!!! I am loving this fresh start to a fresh year. I feel fresh since I shed all my sickness and I am spending my Christmas money like a crazy woman. Yes!! I bought two pairs of boots and consigned and old pair. Out with the old... I bought a black cardigan and black sweater and some cheap funky little jewelry, including this necklace I'm wearing here. I really need a jewelry update but I did not want to spend a lot of money on it. I just don't wear it often enough to justify breaking the bank. The rest went to some tops from the goodwill and some fancy shampoo and conditioner. I didn't get around to getting new face wash or face lotion. Hmmm....I'm getting ready to run out. I love using Aveda for my face wash and Origins for my lotion. I also really wanted to buy a good primer for my face to use under my foundation and start trying a highlighter too. But since I am a shoe addict the bulk of my money went to shoes. I really have been doing well on not buying cheap, crappy shoes anymore. I just can't wear those painful shoes! Why suffer!?! That means that each shoe purchase is serious business! Money wise and narrowing down my selections wise. I hope all of you had a great Christmas. I'm ready to start this new year! I'll definitely be showcasing some of the goodies I got here on the old blog soon!